Eight years after his debut album Neuro, Umek's long awaited Responding to Dynamic will be released under Sixteenofive label. An album that inspired dancefloors worldwide and at the same time an album that was created explicitly to inspire those same party arenas. It is the year 2010 and the advent and widespread use of technology, the internet and unlimited exchange and circulation of information has rendered the classical model of the "music industry" archaic and obsolete. In this rapidly shifting and changing state of flux, artists and labels rise and fall, struggle for relevance and compete for credibility-presenting, marketing and releasing their music onto the masses. 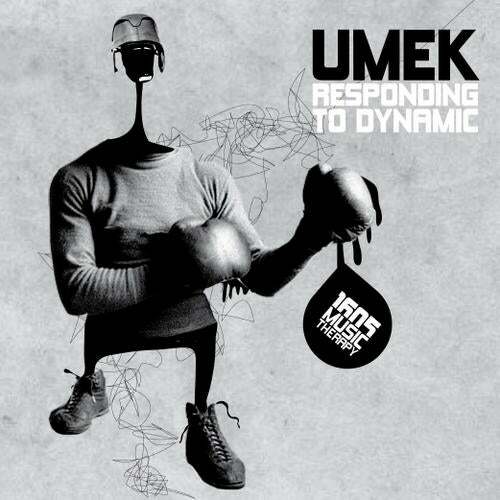 Sidestepping the recent trend for re-invention and/or some ill-advised attempt at a concept album aimed at a wider audience, production powerhouse and overall techno stalwart, Umek, steps up to the plate and delivers his second long-player, entitled "Responding to Dynamic". It is a simple yet bold statement by the seasoned producer and although it may not be a direct "response" to anything in particular, it is a firm indication of what Umek is about, what he plays and what he makes-something ever expanding and fanatical fan base has come to expect. For the uninitiated, Umek has been one of the leading players in the international techno scene, his barnstorming productions and remixes being hammered in every corner of the world by a hugely diverse and stellar cast of DJ's while he himself as a DJ has grown by leaps and bounds, inexorably and unequivocally developing into the respected and acclaimed persona that he is today. His evolution and maturity into the sound he is responsible tells an interesting tale, littered with accolades and highlights from releases on the world's most reputable labels, to establishing and running wildly popular club nights and notably, erecting mighty record labels to offer platforms and forums for his and his likeminded cohorts to release music through! It is these platforms and this unquenchable appetite for new music that has led him to Sixteenofive, his latest venture and the prime focus of his musical activities in recent times. Besides being a highly successful record label in its own right, it is a steadfast statement of how he chooses to write, release and envisions his music-minus any compromise. This is the spirit that characterizes "Responding to Dynamic". In a way it is a summation of the Sixteenofive aesthetic: futuristic, pounding, groovy, eccentric, particular, inventive, meticulous... techno! One could go to great lengths to write about the tracks and their various qualities or how Umek has subverted expectations by delivering a classic, dancefloor-friendly album rather than shifting gears and going into more "experimental" or "diverse" directions for his album. But that's not what we're going to do here. This is not what Sixteenofive lovers want. Umek's 2nd album is everything you have been expecting. Listen. Enjoy. Repeat.